Pre-breeding diet quality is an important mechanism influencing reproduction, and while many avian studies have related pre-breeding diet quality with egg size, clutch size, and lay date, none have looked at the relationship with nest attentiveness. 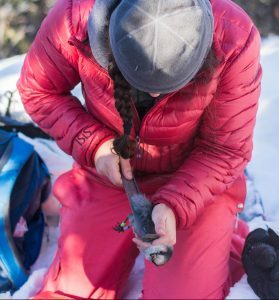 For my MSc, I will conduct an observational study looking at pre-breeding diet quality and its effects on reproductive phenology of Canada Jays (Perisoreus canadensis), a food-caching resident in Denali National Park, Alaska. In addition to clutch size and lay date, I will focus on nest attentiveness as the incubating temperature of eggs can have significant impacts on hatching success and offspring fitness. Considering life history traits and the chilly environment occupied by Canada Jays, I suspect that the pre-breeding quality of a female’s diet varies and can influence incubation behaviour and her ability to maintain eggs at a consistent optimal temperature. This in turn could have downstream consequences on hatching success and nestling body condition, thus impacting overall nest success.